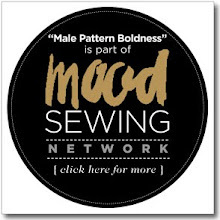 male pattern boldness: Men's custom-made shirt inspection! I found this shirt at Goodwill a few years ago and I've gotten a lot of wear out of it. I even wore it to my brother's wedding last November, you may recall. I really splurged on that outfit. The first thing you'll notice about this shirt is that the cotton is very fine. Is it Egyptian, Italian, Swiss? -- I don't know. But it is gorgeous: cool to the touch and smooth as silk. This Cego shirt has some very nice touches. It has a concealed button placket. I really need to figure out how to make one of those. It has the narrowest flat-felled seams I've seen, measuring approximately 1/8 inch. It has back darts, giving the shirt a more tapered fit. Buttons are mother of pearl. No doubt due to the fine fabric, the shirt feels light, but sturdy. Construction is excellent, though there are a few thread issues here and there that the average person wouldn't notice; I never did. How much does a shirt like this cost? Well Cego custom shirts start at $100, and with this fabric and some of the special details (like the hidden placket) I'd guess double that. Not the most expensive custom-made shirt out there but it's nice. 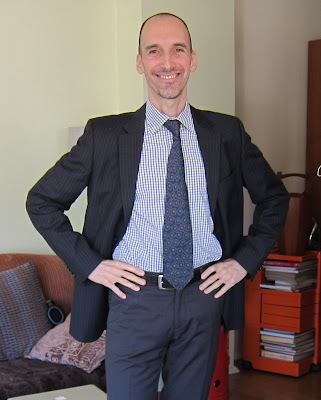 BTW, Cego's shirts are not bespoke, but rather custom tailored using pre-existing block patterns modified on a computer program; an individual pattern is not drawn up specifically for you. Most of the actual shirtmaking goes on in nearby Newark. So what do you think? Before I plunked down $185 for a Thomas Pink RTW shirt I would certainly go to Cego or some other local custom shirtmaker, wouldn't you? Of course, you need to know what you're looking for in a shirt and many people probably don't. More pics of the Cego shirt here. The Thomas Pink shirt pics are here, the Gap shirt pics here. Compare and contrast! I'll be examining some other shirts in the week ahead. Friends, I am going to start another shirt of my own today. I'm giving Eisenhower-era McCalls 3087 a try. 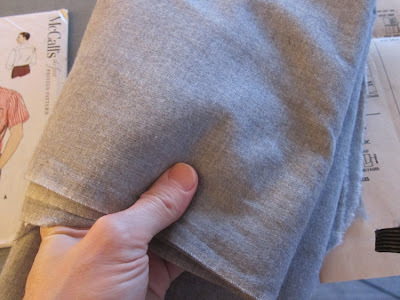 I'm opting for a solid gray cotton flannel with contrasting topstitching. No plaids. We'll see how this turns out -- it's an unusual design by today's standards (it's a pullover) but must have been quite popular in the mid-Fifties because there are a lot of men's shirt patterns with this design out there. 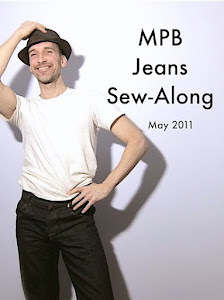 In Sew-Along news, our Sew-Along Flickr group is growing fast and if you haven't uploaded a photo of your pattern (if you're not sewing Negroni) and/or fabric please do so in the days ahead. It's great fun to see what people are planning and there's quite a bit of commenting going on too. You don't have to join the group to visit it, of course, just to upload photos and/or comment. If you wish to join, email me (peterlappinnyc at gmail dot com). The drama here surrounds the imminent arrival of my Elnapress, though Michael is doing his best to stir up a frenzy over our kitchen freezer. Whatever floats your boat, right? 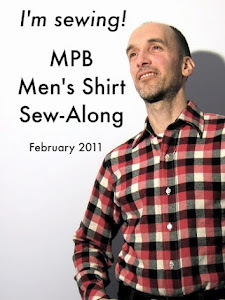 I'm enjoying these posts on dissecting men's shirts! Quite a variety of quality. Are those darts hand knotted at the end?! When I learned to sew I was taught to do that and often still do. I was taught to sew with smaller stitches than what I've seen called for today too. The problem with those tiny stitches though is picking the blasted things out when I make a mistake! (I'm into basting a lot more lately). I'm curious about this new shirt, such as how you get your head in it. Susan, the darts aren't knotted. They are stitched with tiny, tiny stitches that simply won't pull out. The secret of McCall's 3087 will be revealed in the days ahead! You do manage to keep us all a captive audience! Let me point out that -any- shirt of yours can sport back darts, if you like them. All you need is to make a well-fitting block with them, and then transfer them to any shirt, whether found on the street or not, with very little trouble. Because they don't go into a side seam like most women's bust darts, you can just add them to a finished product. Another technical point is that you seem to equate small stitches with good tailoring, as if you were some sort of 1950s quilter. But there's more to it than that. Yes, it's good if finer stitches go with finer fabric, but that's if you also get finer thread. There is a point where smaller stitches are self-defeating. And if your stitches are too close in fabric whose thread count doesn't match, you risk weakening the fabric by creating more holes in it. So don't just knee-jerk your eye into thinking that smaller is better, it is only if it's -appropriate-. Is it just me, impressed by how they make the *darts* match up in the plaid? This seems an excellent shirt, certainly better than the Pink. How can you tell from the online description if a cotton is high quality? The country? The thread count? I'm learning so much lingo too, I'd thought that custom made meant the same as bespoke. My 401 is supposed to arrive via UPS tomorrow by end of day, around here that usually means 8:00 pm. I can hardly wait. There was no pic, I'm trusting a description--the storyline builds tension...Too much stuff for one box...A cabinet broken down...Epp. sigh... faint... Extra bobbin spools found at the last minute... A meticulous previous owner...maybe some feet? Me hubs is forever bugging me to sew back darts on ALL his shirts. I am so afraid. Any huge secrets to back darts? @Marie-Christine "Another technical point is that you seem to equate small stitches with good tailoring, as if you were some sort of 1950s quilter"
I nearly blew coffee out of nose! Omg, ha ha! Peter, I LOVE the look of the pull-over shirts and have been considering making one of those for my husband. I think it's a great look, and I'm excited to see you in it! 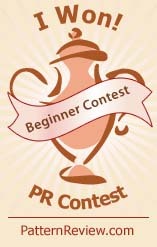 Puu, yes, we are going to start from the VERY beginning of the process. I feel as if I'm taking a graduate seminar in shirt-making! 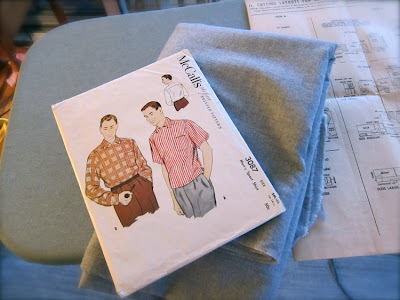 McCall's 3087 is in my queue -- in fact, I wrote a post about it last week that I published today, motivated by this one. It might be worth a look; it's not exactly about the pattern. Now this is interesting. I'm rather intrigued with the topstitching being small. I typically do a larger topstitch on garments and that only because I thought that was what you were supposed to do. But, now that I actually think about it, smaller topstitching makes sense because it doesn't come apart as easily, much more sturdy. It is a gorgeous shirt. I generally opt for longer stitches when I'm topstitching jeans. I like the individual stitches to be readable as such. Tiny stitches can look like a continuous line of thread, depending on the thread, the fabric, thread tension, etc, which I don't like. That's a great link Peter, thanks! Great blog, this. Interesting shirt comparison. I like how the side seam is almost as narrow as the checks in the fabric. Interesting. All of it good stuff. Isn't it interesting to compare shirts? From what you've shown us, the more expensive Pink and the Cego would not have passed my quality control (Cego join in topstitching, Pink general messiness), but the cheaper Gap shirt would have! It seems the cost difference is mainly in fabric and market positioning, rather than quality construction. How timely--today's Wall Street Journal has an article on the shrinking shirt collar. I though that you might find it of interest. How on earth do you manage to sew a flat felled seam that narrow?? Wow. Argh, I need to get started on this project. I got delayed because of a dress I'm working on for myself that is causing me a lot of pain. I am very jealous of your making that pattern, I have the kids version but have been on the lookout for the adult's one! Lisette I think there are five of this same McCall's pattern for sale on Etsy. This series is so much fun. You're right, I'd go custom made before I'd pay for a pink shirt any day. I saw your videos on youtube, and now I am here. I am a beginner sewer. 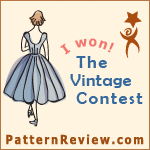 I love vintage patterns for children. 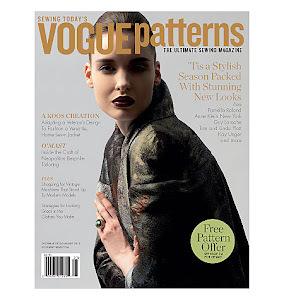 However, I have been told that vintage patterns are not that easy to sew from, and are often not accurate in the cut. Is this true? I have a pattern, and I am now reluctant to try it.